Enjoy becoming a student again and fall in love with computer science! The Computer Science Crash Course will help you gain CS content knowledge and strengthen your coding skills in either Python or Scratch—you choose. Led by current computer science teachers who will demonstrate best teaching practices based on many years of experience, this differentiated course uses a variety of leveled activities and coding challenge sets to encourage middle and early high school teachers (grades 5-9) in all subject areas to advance their own learning. 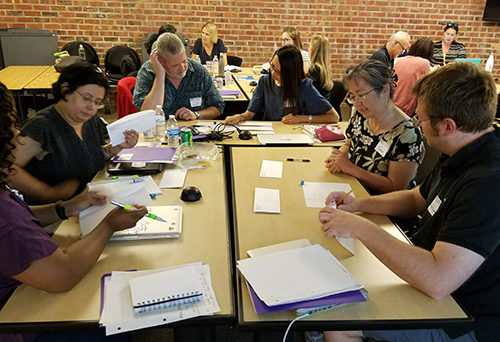 With K-12 CS standards-aligned lessons on algorithms, data, the Internet, and the impact of computing, you will discover that computer science is more than coding. You will also gain exposure to the many available tools and open curriculum resources that you can apply to your particular classroom needs. You do not need any prior computer science experience. All levels welcome. You will receive a certificate for 30 hours of professional development. Foothill college credit is available towards the new California Supplemental Authorization in Computer Science. Two programs scheduled for this summer: June 17 - 21 and July 29 - Aug 2. You can choose which program to attend during the application process. Half Day CS Workshops will be scheduled periodically. Information on how to sign up can be found HERE. Or contact Liane Freeman at ude.adhfnull@enailnameerf. The KCI Computer Science program has a STRONG record of success. Sample testimonials below show the positive reviews from teachers who have attended previous workshops. ...wonderfully staffed and well prepared. The Computer Science Crash Course was wonderfully staffed and well prepared. The course allowed for participants to step out of our teacher roles and to be students. Upon arrival, students were provided with color-coded hour-by-hour agendas. Every moment was structured with thought, providing insights on how to deliver quality differentiated computer programming curriculum. The course included flowcharting, coding challenges, unplugged activities, time to plan and networking. Following the course, during an elective class, I delivered coding challenges which were directly taken from the course. These challenges resulted in experienced Scratch users being gently pushed to use logical thinking skills. Not only did this course extend my content knowledge but it helped me significantly improve my coding skills. I was able to hone my skills in CS and taught at two school sites this year. I was able to use a lot of knowledge that I gained from the KCI Computer Science Crash course. Not only did this course extend my content knowledge but it helped me significantly improve my coding skills. The enthusiasm and passion of the instructors helped us all love this subject. Classes were well-paced, and gave us a good balance of lecture time, practical time as well as unplugged activities. It was well rounded, and structured in a way that both beginner and intermediate skill levels were challenged. The organizers had put a lot of thought into the workshop. I would definitely participate in future workshops! ... there is so much more to computer science than coding. I significantly improved my coding skills and also learned a lot of basic things about computers and networks that seems useful as background knowledge. I learned so much Python! I also learned a lot about my own personal learning style. Gained a tremendous amount of confidence and excitement about Scratch and Microbit. I learned that I am capable of coding myself. I learned that there is so much more to computer science than coding. Sheena Vaidyanathan has been teaching computer science in California public schools for 8+ years and has extensive experience with K-8 curriculum development and professional development. Prior to her teaching career, Sheena worked in Silicon Valley’s technology industry. She holds undergraduate and graduate degrees in computer science as well as a California Single Subject Teaching Credential in Math. She has presented at several conferences and writes articles on CS education. See more on her work at Computers for Creativity. Chris Bell is a Math and Computer Science teacher at Gunn High School in Palo Alto, California. He is also a Teacher on Special Assignment (TOSA) for blended learning and technology integration. One of his ongoing goals is to provide all students an engaging Computer Science experience; hopefully, sparking a desire to explore more in the fields of Computer Science and Engineering. Chris has worked with local Colleges and Universities to provide teacher trainings on math, computer science, and educational technology instruction. Currently, he is dedicating a lot of thought towards the perfect recipe for homemade pasta, which he hopes to crack soon. Jessica Hexsel has been teaching at Gunn High School for five years. She started by teaching Mathematics courses and quickly began teaching computer science courses. For the past two years, Jess has been teaching Functional and Object-Oriented Programming with Chris Bell, from whom she often steals materials…like this bio. She also teaches AP Computer Science Principles. Before moving to California and earning a teaching credential, Jessica worked in educational research at Carnegie Mellon University developing curriculum for web-based online tutors for middle-school mathematics. Ann Greyson started her career as a software engineer at Apple. She currently chairs the Computer Science & Engineering Department at Castilleja School, an independent school for girls, and designs and teaches both computer science courses and integrated computer science projects in grades 6-12. Before teaching at Castilleja, she taught algebra and geometry in Redwood City and Burlingame public school districts. She holds a bachelor’s degree in computer science from UC Berkeley, and a California teaching credential. Abigail Joseph has an extensive career as an educator in the Bay Area. Her commitment to education began in the MESA (Mathematics, Engineering, and Science Achievement) Center and classrooms at Cabrillo Community College and various technology and engineering after-school and summer programs. She has spent the past five years developing computer science programs at Bay Area schools and working as curriculum and technical volunteer for Black Girls Code. Abigail currently works part-time as Computer Science and Engineering Faculty at Castilleja School in Palo Alto, CA and is MIT Master Trainer for App Inventor. Additionally she, as a co-founder of edstoria, is developing programs for teachers to help them thrive, grow, and sustain themselves in and out of the classroom.. She holds a B.S.E in computer science from Princeton University and an M.S./Ph.D. in computer science from the University of California at Santa Cruz.